It today's preview, we take a look at one of the best parts of being the Dungeon Master—the distribution of treasure! It’s good to be the dungeon master! Not only do you get to tell fantastic stories about heroes, villains, monsters, and magic, but you also get to create the world in which these stories live. Whether you’re running a D&D game already or you think it’s something you want to try, the Dungeon Master’s Guide is the book for you. Adventurers strive for many things, including glory, knowledge, and justice. Many adventurers also seek something more tangible: fortune. Strands of golden chains, stacks of platinum coins, bejeweled crowns, enameled scepters, bolts of silk cloth, and powerful magic items all wait to be seized or unearthed by intrepid, treasure-seeking adventurers. Chapter 7 of the DMG details magic items and the placement of treasure in an adventure, as well as special rewards that can be granted instead of or in addition to magic items and mundane treasure. When you use a Treasure Hoard table to randomly determine the contents of a treasure hoard and your roll indicates the presence of one or more magic items, you can determine the specific magic items by rolling on the appropriate table(s) here. Treasure hoards are more fully described in the DMG (pg. 133); here’s a sample treasure hoard table for your perusal. 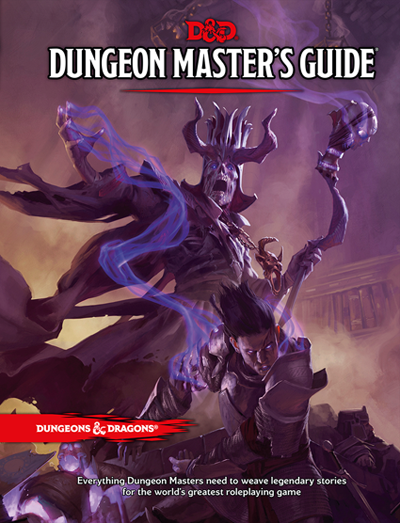 The Dungeon Master’s Guide provides the inspiration and the guidance you need to spark your imagination and create worlds of adventure for your players to explore and enjoy. Inside you’ll find world-building tools, tips and tricks for creating memorable dungeons and adventures, optional game rules, hundreds of classic D&D magic items, and much more!